Elderly Snail – From SpongePedia, the biggest SpongeBob-wiki in the world! 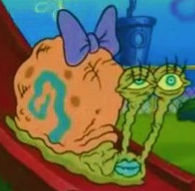 The Elderly Snail is a very old snail that has been seen in the episodes Gary in Love and Plankton's Pet. Gary thought that she was his dream snail Mary. She has an elderly "meow", considering she is very old. She also appears in Plankton's Pet and Plankton calls her "too slobby".